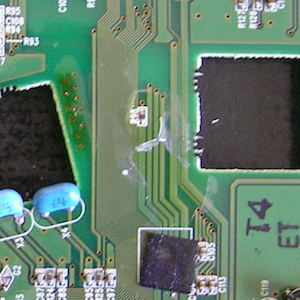 Delamination in conformal coating is where the coating lifts from the surface of the PCB. This leaves the circuit board area below exposed. The lifting can be partial or complete. It can occur naturally due to a reaction in the materials. It can occur during the process such as de-masking. Download our PDF guide Solving conformal coating problems in the application process now. Examples are shown in the images where the conformal coating has lifted away from the surfaces, leaving torn and/or non adhered coating, producing a poor finish. Cleanliness: The cleanliness of the surface for good adhesion. If the surface is contaminated across a wide area then delamination can occur due to the poor adhesion of the coating to the laminate. Compatibility: the conformal coating and the surface to be adhered to need to bond together. If they are incompatible then they will not bond. This incompatibility may by due to surface energies mismatch. 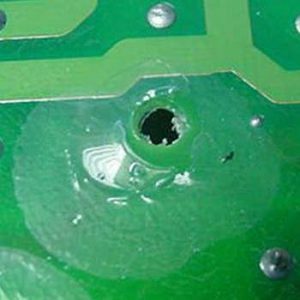 If the conformal coating is not matched to the laminate then delamination can occur. Permeability to moisture: If the coating allows the moisture to permeate into the region between the coating and the laminate, then a difference in vapour pressure occurs. This could lead to osmotic pressures building due to a change in temperature and pressure, which lift the coating away from the laminate. Degree of coating cure: If the conformal coating is not cured correctly then this can lead to adhesion problems and mismatch of Coefficient of Thermal Expansion (CTE). Cleanliness: Clean the surface of the board to improve the adhesion of the coating. 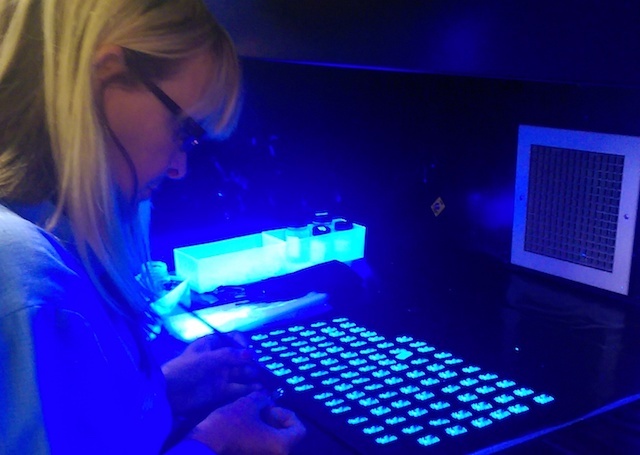 Remove contamination such as mould release agents on components before application. Compatibility: Match the conformal coating to the solder resist and laminate so that good adhesion is achieved. Change the coating and / or surface finish so the surface energies are more favourable. Permeability to moisture: Choose a less permeable conformal coating. Reduce the coating thickness: This reduces the problems associated with CTE mismatch with the components and laminate that lead to flexing of the coating. Lower the Cure Temperature: Reduce force drying (thermal profile) during curing to avoid excess stress and strains on the coating. Prime the surface: Apply a primer to treat the board surface. This will increase the bonding of the conformal coating to the substrate.